When evaluating the future of America’s job market, there are two distinct approaches to take. The optimist could point to a steadily declining unemployment rate — currently sitting under 6 percent — as a reassuring sign of things to come. Using the most recent data from the BLS and the Foreign Labor Certification Data Center, we found the 27 careers with the highest projected increase in employment percentage by 2024. For this list, we used BLS employment projections and only took into consideration careers with at least 10,000 employees and an average annual salary of $35,000 or higher. 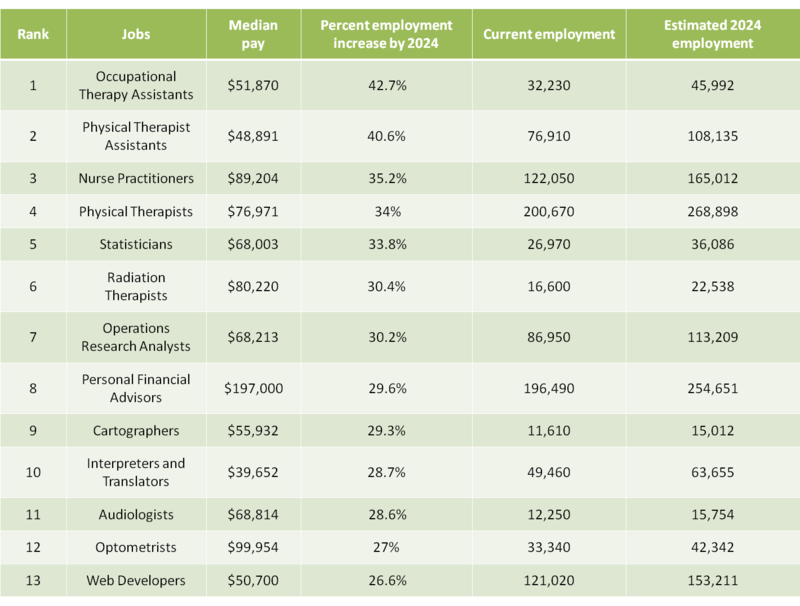 Occupations are ranked according to their projected employment increase. In the event of ties, the career with the highest current employment was ranked higher.